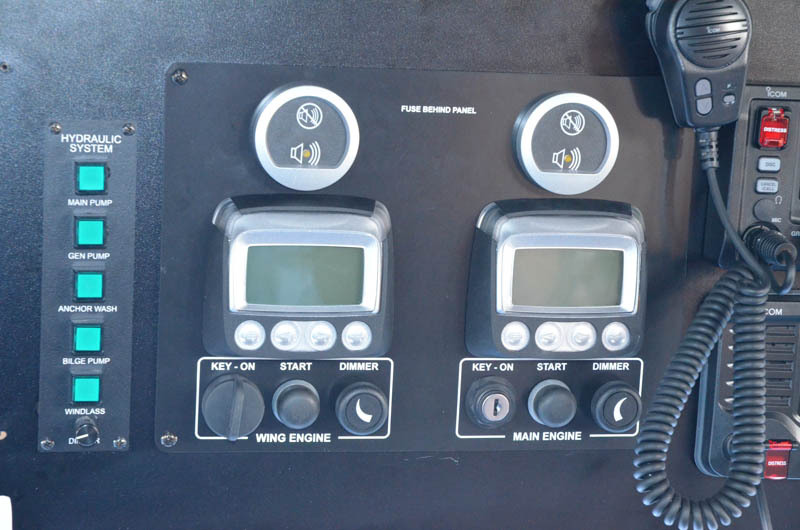 Both our main and wing engines have instrument monitoring panels in the pilot house, and the main engine has a second one on the fly bridge. 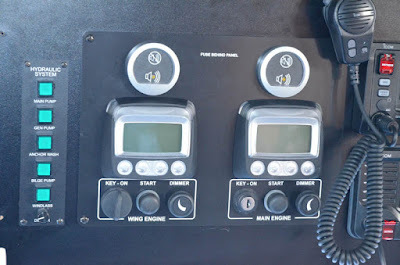 Communications between the engines and these panels is over a standard communications interface called J1939, and it is used universally in trucks and other modern heavy equipment. It is standardized, reliable, and very widely used. 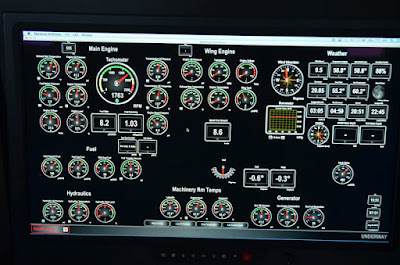 Additionally, I have Maretron adapters that tap onto the J1939 engine buses and convert the data to NMEA 2000 where I then display it using N2KView. As a little aside, J1939 and NMEA 2000 are EXACTLY the same thing with one minor difference; NMEA 2000 uses it's own set of messages dedicated to marine applications. Over the past year I have noticed a very occasional drop out of the engine display data on N2KView. For just a second the gauges will drop to zero, then come right back. I really can't say how often it happens because you need to be looking right at the display at just the right time or you will miss it. This issue finally bubbled to the top of my list so I set out to see if I could figure out what was going on. 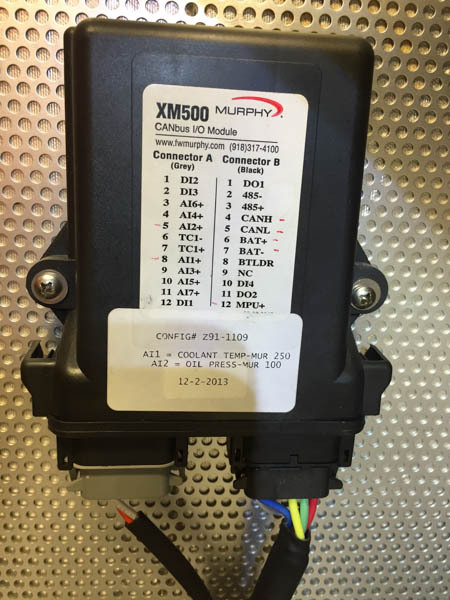 The so-called "data bus" used by J1939 and NMEA 2000 has to be properly terminated. The electrical signals on the wires are much like the ocean waves most readers are familiar with. In the open water, waves propagate freely and you can clearly tell one from the next. But if those waves hit a wall, they reflect back and you end up with colliding and overlapping incoming and reflecting waves, making it much harder to tell what's what. A data bus behaves much the same way. When the electrical signals hit the end of the wire, they reflect back the way they came, creating the same jumbled mess of signals, and lots of opportunity for errors. 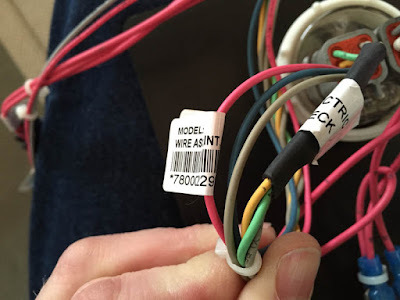 To solve this, the two ends of the cable are "terminated" using a resistor. By picking the right value resistor, the signals are completely absorbed and there is no reflection. In this case, the magic number is 120 ohms. If things are acting wonky on a bus like this, the first thing to verify is the termination, so I broke out my meter and checked. If you measure with both terminators in place, it should read 60 ohms (two 120 ohm resistors in parallel is 60 ohms). If only one terminator is present it will read 120, and if none are present it will read infinite, or an open circuit. Well, the bus for my main engine read 30 ohms and the bus for the wing engine read 120 ohms. Wrong answer in both cases. The 30 ohms, by the way, suggests that the bus it double terminated at both ends, i.e. there are a total of four 120 resistors, not two. 1) The main engine bus was double terminated at the engine end of things. 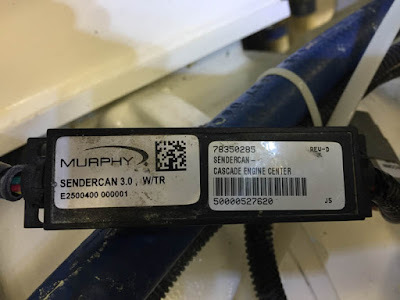 There is a cable connector where a terminator plug can be installed, and sure enough one was installed. 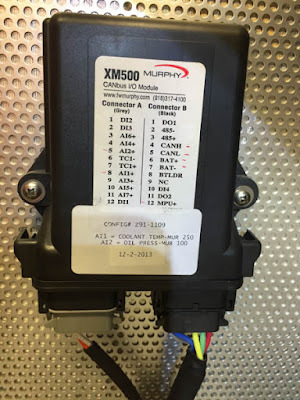 But there was also a small converter box for sensing the transmission temperature and pressure, and this box has termination built into the box. The result was double termination. 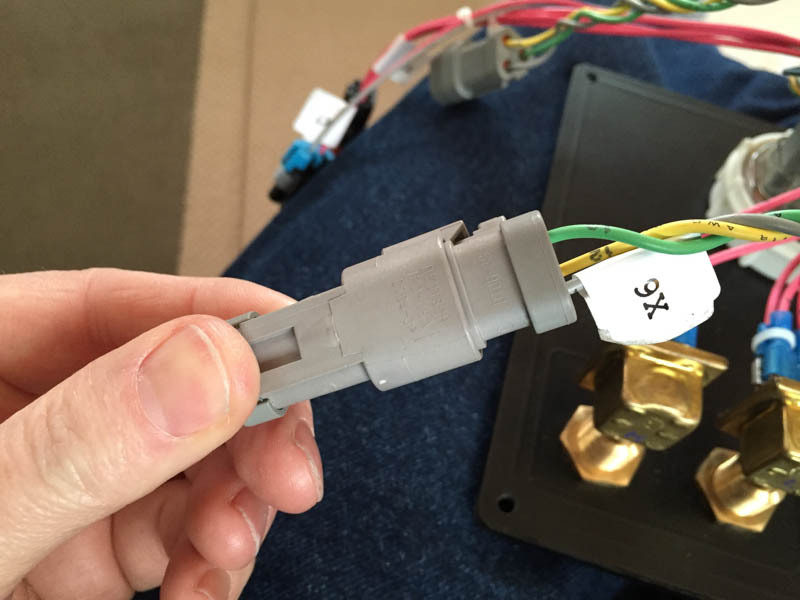 The solution was to remove the terminator plug and replace it with a blank plug end. 2) The main engine bus was also double terminated at the fly bridge control panel which is the other end of the bus. In this case there was another connector and terminator plug, but the wiring harness for the gauge panel also had termination built into the cable. The result once again was double termination, and the solution to remove the terminator plug and replace with a blank cap. 3) The wing engine bus was not terminated at all at the engine end. There was a wiring harness at the engine that was supposed to have built-in termination, but there was none. The solution was to modify the harness to add a terminator resistor. Now with everything back together, both buses measure 60 ohms as they should. We will be underway in a couple of days and I'll be able to verify that things are working correctly now, but I expect this will resolve the problem. Well done, Peter! It must be very gratifying to solve a problem such as this, by yourself, at minimal expense. Nordhavn obviously slipped up, but nonetheless am sure that you are enjoying the boat. Yes, it's gratifying to have it sorted and to know it's now set up correctly. As for where things went wrong, it's hard to say, but I think Nordhavn/PAE are low on this in this case. 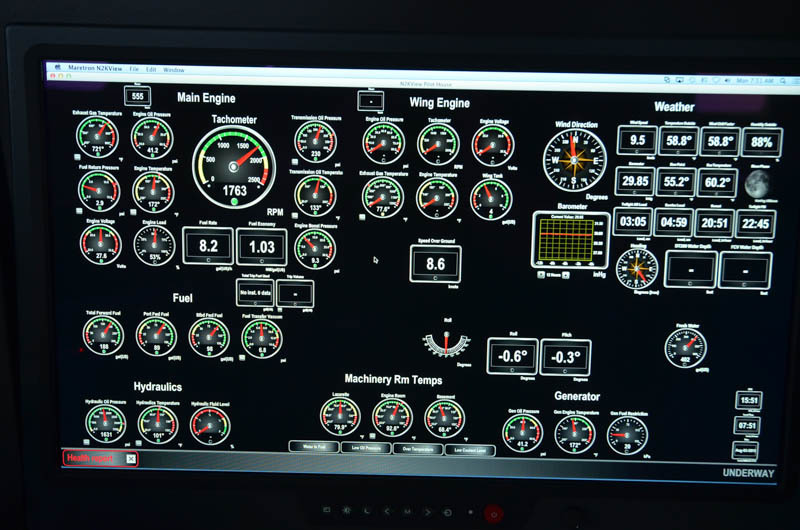 The Deere distributor details the engine control setup and supplies the equipment. The yard then installs per that design. My guess is that most of the problem lies with the selection and specification of the various components. But it's really up to them to figure out how to prevent it from happening again.